ESLvideo.com is free. Students do not need to create an account to view quizzes or send you their quiz scores. The content on this site is made by teachers. Some of the quizzes focus on grammar, others listening, or vocabulary. Some quizzes are meant to be done before watching the video, others after. You can download the PDF of any quiz. Additionally some quizzes come with a Worksheet for classroom use. Students can send you their quiz score by entering their class code on the quiz results page. To create a class code, login and go to your Teacher Dashboard >> Class Code page. Teachers can assign quizzes to a "Class" by clicking the " Add to Classes" button on quiz pages. Quizzes you assign display on that Class Page. Students can quickly navigate to a Class Page you've created by entering their class code on the homepage. Homepage > Class Code dropdown field. If you have any questions, please reach out via the Contact page. You can embed quizzes on Canvas (or other LMS or webpage) using the quiz embed code which is located below the video on quiz pages. If you'd like to create a quiz, or have your students create a quiz, register and login. Then click the Create a Quiz button. Click here to see a short video tour of the quiz builder. 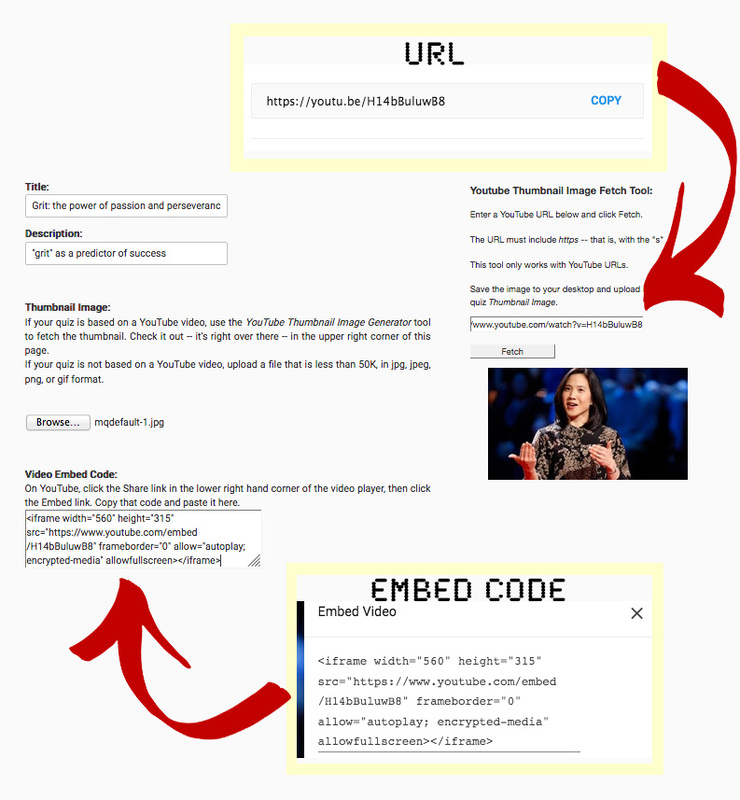 Step 1: Enter the title, description, video embed code, and upload a thumbnail image. Step 2: Enter the questions/answers, transcript, and notes. Step 3: Proof and share your quiz.